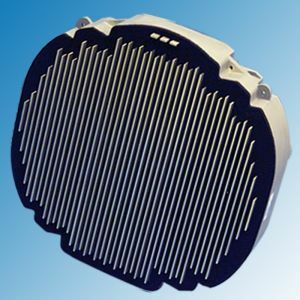 The AN/APG-80 is an airborne multimode radar using an Active Electronically Scanned Array (AESA) with around 1000 T/R Modules. The APG-80 is designed to search continuously for and track multiple targets within the forward hemisphere of the aircraft. As a result of increased operational flexibility, pilots will be able to simultaneously perform air-to-air search-and-track, air-to-ground targeting and aircraft terrain-following. The development of the AN/APG-80 based on AN/APG-68 and is manufactured by Northrop Grumman. The Radar is intended for use in Lockheeds fighter F-16E/F. Northrop Grumman supplied its APG-80 AESA to the United Arab Emirates for its Block 60 F-16s.